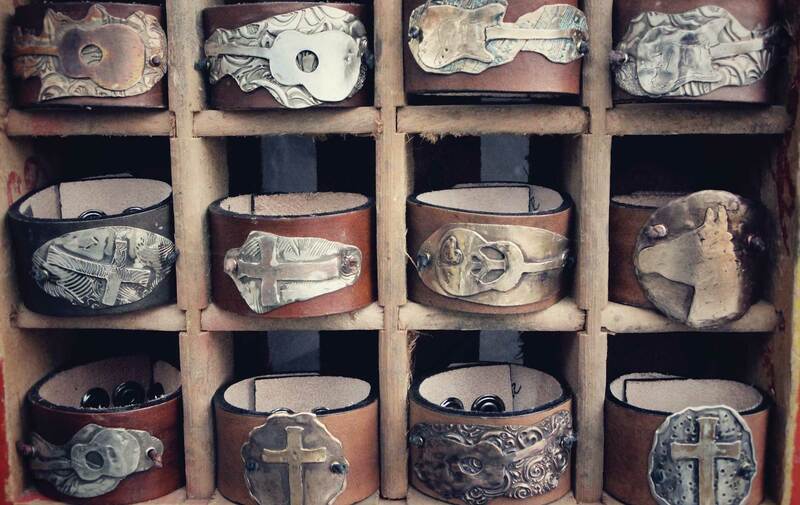 Inspired by horses, country music, and religion, Annie Parker designs and hand makes cuff bracelets that are not only turning heads, but also taking off with a wide range of buyers. “My cuffs are unisex,” says Parker. “I really wanted to create jewelry that men could wear also.” In fact, fans who watch the popular new Nashville television series on ABC might have spotted one of her originals on the arm of handsome Charles Esten, who plays the character Deacon. From the outside looking in, Parker’s life seems much like a dream come true and, from her perspective as well, she couldn’t hope for more—at least not much more. Regarding her jewelry, Parker says, “I’ve always been an artist at heart.” When her twenty-eight-year-old daughter, Amanda, was small, Parker put her talent to work in cake decorating. While living in Atlanta, she also started taking design classes at the Atlanta Decorative Arts Center. From studying design, she moved to acrylic classes and then on to jewelry. At this time, Parker was also active in the world of tennis, so she began making tennis earrings, which she sold in pro shops in Atlanta and in Miramar Beach, Florida. Upon moving to the Gulf Coast, Parker became involved in her horse farm, Gulfside Trail Rides and Stables, with her partners. The farm is located in Santa Rosa Beach, Florida. In addition to offering horseback riding lessons, trail rides, and boarding, the ranch serves as a venue for all kinds of private events, from children’s birthday parties to a sixtieth birthday bash for a Grammy Award–winning musician, as well as VIE’s recent Sea + Farm + Table harvest dinner. Corporate affairs and weddings are also held at Gulfside, and planning such events presents yet another creative outlet for Parker. For a time, fine art was something she would do in her spare time. “I painted for a while,” says Parker, “but I just wanted to get back to jewelry making.” While tossing around different ideas of what to create, Parker considered what she would like to wear herself. She decided on a casual country theme. “I loved the look of leather and pearls,” adds Parker, who appreciates rustic beauty. Opting for something a little more casual, she chose bronze and sterling silver for her media, and then began buying hammers and cutters, soldering materials, and metal clay to form her new designs. Her personal favorite, also the first one Parker sold, is a horse head. “That piece got me started,” she says, adding that all the designs symbolize things she loves. “I’m obsessed with the city of Nashville,” she reveals. “I can’t sing or play guitar, but I love the music.” And musicians love Parker. In addition to actor-musician Esten, an assortment of music celebrities wear her cuffs, namely musician and songwriter Tim Jackson, singer Geoff McBride from The Voice, and Northwest Florida’s Forrest Williams of the Forrest Williams Band. On another note, 2013 Miss Rodeo Florida, Jenna Smeenk, also has an Annie Parker cuff. Aside from the country and music themes, also popular are faith-based creations. Crosses are a popular design, as are angel wings, which Parker first made for Stacy and Bryan Pritchett, the owners Mercantile boutique in Seaside, Florida, to mirror the store's logo. “The angel wings became one of my best sellers,” Parker says, having recently made an angel wings cuff for a girlfriend of hers who is getting married. A number of customers order the design to wear in memory of a loved one and ask Parker to add the initials of the person who has passed away. If they have something special in mind, customers are invited to custom order designs. Annie Parker cuffs come in a range of sizes to fit all women and men. Prices range from $98 for bronze to $195 for sterling silver. Parker is currently in the process of building her retail distribution, and plans to add necklaces, earrings, belt buckles, and other pieces to her collection. Without a doubt, each piece is lovingly made. “The part of the process with my hands on it takes about two hours,” Parker says, explaining that the firing takes several hours. Boca Boutique & Galeri – Destin, Florida Burlap Ranch – Tomball, Texas Gammy Designs – Ontario, Canada Gulfside Trail Rides and Stables – Santa Rosa Beach, Florida Mercantile – Seaside, Florida Two Old Hippies – Nashville, Tennessee, and Aspen, Colorado Gulfside Trail Rides and Stables can be reached through Facebook.